This has been a week of frustrating tech woes and long calls to support people (all resolved, hopefully), so I was especially looking forward to yesterday’s Show and Tell at my Studio. I hadn’t heard from many people and there were more storms predicted in our area, and I didn’t expect a crowd. Surprise! 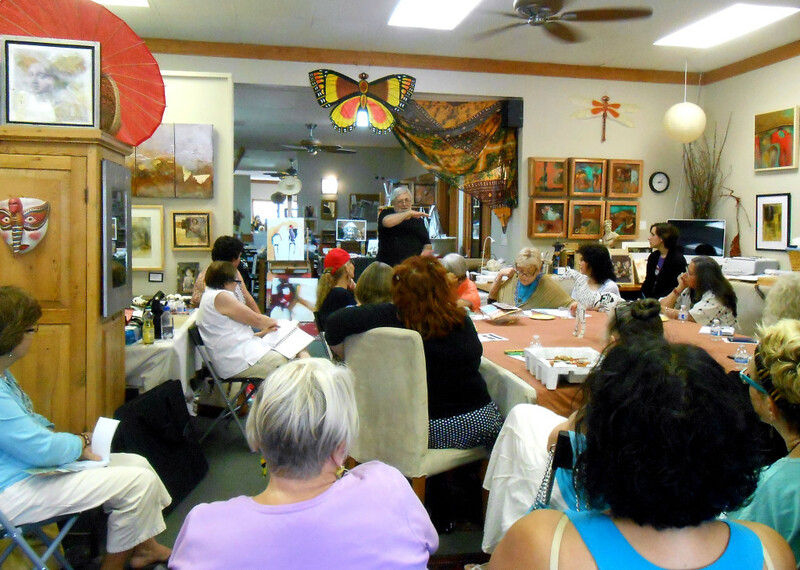 Almost thirty people came to listen and learn, network and eat, and enjoy the creative company. These informal Saturday afternoons have become my favorite Studio event because it’s a happy free-for-all marathon of collaborating and brainstorming. Take a look at the video and you’ll see what I mean – it was a fun day, even when the storm knocked out the power! Hope everyone got home OK :). And if you’re around next month, be sure and join us – details coming soon. This entry was posted in art, Studio and tagged saturday, show and tell by lynbelisle. Bookmark the permalink. The show and tell was delightful. Everyone has such an interesting story to share. Left a little early because of the storm, hated to miss a single word. Thanks for coming, Teri Gay – you are always such an asset to the gathering – see you soon! PS – glad you got home safely! Angi, it is always so great to hear from you – maybe we can set up a webcam one of these days! Love the idea of a ‘show and tell’ gathering:) So wish I lived closer so could be part of the group. Congrats on such a wonderful turn-out. Clare, nice of you to drop in 🙂 – I’ve talked about your work so much at these gatherings. you’re a terrific inspiration!